Waffle Flower...isn't that a cute name for a company? They have a sketch challenge on their BLOG. I only have one Waffle Flower Stamp. It's called Notions. fun deciding what to put where on this sketch. Nice job!! 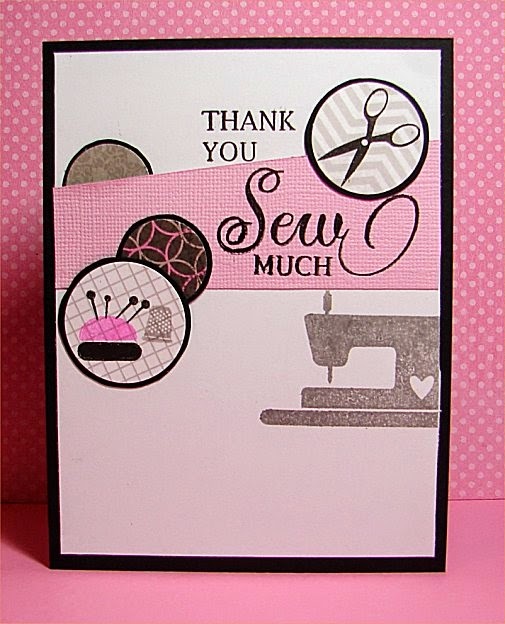 Love the sewing machine. What a pretty card I love the textured pink paper and the layering you did, this is a great set with many choices and I think you did a great job choosing these pieces to put on your card the end result is lovely. I'm sure Nina was happy to see what you had done with her set! Beautiful take on the sketch!!! Thanks for playing along with Waffle Flower Challenge #1!!! Fabulous!! I love how you used the circles and added images to them!! Thanks for playing along with us at the Waffle Flower Challenge!! !